Jack Harvey says winning the British Formula Three title with a superb final round at Donington Park gives him the ideal platform to progress his career. He won the first and third race and was sixth in race two to overhaul rivals Jazeman Jaafar and Felix Seralles. 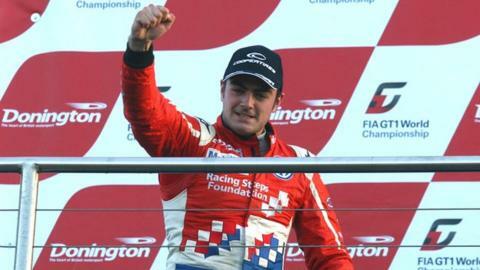 The 19-year-old Carlin Racing driver follows F1 world champions Ayrton Senna and Mika Hakkinen as series winners. Harvey, who is from Bassingham, told BBC Lincolnshire: "Some of the best people in motorsport have won this." Victory in the first race on Saturday set the platform for his title glory. And Harvey was thrilled after what he described as a "perfect weekend" in the final race of the season at the Leicestershire circuit. He added: "It's everything we have worked towards. I'm almost speechless and I don't really know what to say. It's been a fantastic effort by the team and we delivered when we needed to. "I haven't been speechless many times in my life, but this is one of them. "This weekend's been pretty perfect for us. The team have been great and the support has been incredible." Harvey, who secured the title in only his second season in F3, said: "I have joined a select group. This should give us some confidence of where we can end up in the future. To win Formula Three is a great thing to have on your cv, and we have achieved it."